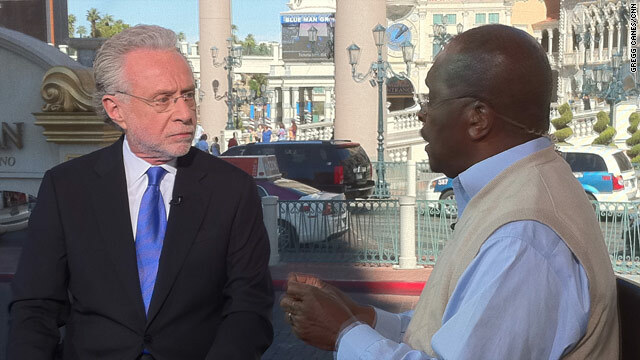 (CNN) - Herman Cain said Tuesday he could feel the pressure from his fellow 2012 candidates ahead of the CNN Western Leadership Conference Debate in Las Vegas. "The way it feels is that you got this big bull's-eye on your back, and it keeps getting bigger," Cain told CNN's Wolf Blitzer on "The Situation Room." Programming note: GOP presidential candidates next face off at 8 p.m. ET Tuesday, October 18, in the CNN Western Republican Presidential Debate in Las Vegas, Nevada. Submit your questions for the debate here. "It feels great, but as you know, the challenge is 'how do we continue that momentum?' and we believe we know how to do it." Cain said he was prepared to take on the current GOP frontrunner, former Massachusetts Gov. Mitt Romney, who Cain said was trying to present himself as something he was not. "The biggest problem I have with Governor Romney, who I respect, is him trying to say that he is the non-politician, business candidate," Cain said. "I am the true non-politician, business candidate in this race. He was a Wall Street executive. I was a main street executive. Because I dealt with individual businesses." When asked if Romney was a Christian, Cain refused to answer, saying he was focusing instead on his opponent's platform. "I want to basically defeat Mitt Romney based upon the strength of my ideas versus his," Cain said. "I think I've got a strong plan relative to his, as well as strong ideas about the other issues we face." When responding to foreign policy questions, Cain gave mostly vague answers, saying that he would need all of the intelligence and data to give firm answers. When asked about Monday's swap of one Israeli soldier for thousands of Palestinian prisoners, Cain wouldn't say for sure if he would make a similar decision as president. Cain wouldn't say whether he'd support the Israeli government's decision. "I would have to know all of the considerations he made to say yes or not, because I'm sure that there were a lot of considerations he had to make in order to make that decision," Cain said. "On the surface, you would say one for hundreds doesn't make any sense, but here's how I make decisions and this is why I respect Prime Minister Netanyahu so much. He looks at all of the facts before he makes a judgment call. We don't know all the facts." MLK,Jr '48 & I, '50 never heard pages from the GOP playbook as spoken by Cain. by Dr. Mays on his Tuesday AM teachings. Does Cain realize that the GOP is using him like a "HouseBoy"? It's Sarah, Herm. She's in her helicopter and thinks you're a moose. DUCK!!!!!!!!!!!! Is Cain for real? Or, just a houseboy? Florida Frank is correct. I remember Perot's warning and it's shame not enough listened. Same goes for Dorgan's warning about repealing Glass-Steagall. I am listening to the anti-Obama dedate. No one can answer any of the darn questions without swinging at Obama. We have killed America ouselves. It was bound to happen with all the adverse races allowed in this country. There is no weeding them out but there is a way they will breed most of the other races out. We will soon be called the pink, purple, people eater with no brains except watermelon seeds. He'll have to pay the price for taking the low-hanging fruit. The right-wingers will throw him under the bus in a heartbeat now that they've shown the nation how "liberal" they can be – until it counts. It is unbelievable... First CNN promoted Obama, now they are promoting Cain. Every single interview is with Cain. First person Anderson intervirwed after the debate was Cain. What CNN has in mind is to have on the GOP side somebody incompetent to run against Obama, because you look all democrats. Bunch of morrons!!!! I don't know but part of me thinks that Cain is taking the right wing party for a "joyride". In fact he is a right wing Tea Party type DREAM candidate. He says ALL the stuff they like to hear from protecting the upper 1% to being pro-life. He claims to be a Christian and of course a family man. He has this story that he came from a 'poor" background and is a self-made millionaire (some seem to forget Obama was not rich either and was raised by a single mother, but oh well) and the BEST thing is he can play the "race card" and not even have to worry about it. He can say the stuff the "I want my country back!" folks would love to say in public but can't. He can diss Obama, be anti NAACP, say black folk are brainwashed and racists if they dissagree with him and he's BLACK saying it. He almost blew it calling Perry out about that n-word rock business, but when he heard whispers of discontent from Boss Limbaugh he walked that back too. I just wonder if when Cain gets home to his family if they all sit down and laugh and say we are really fooling them.....or THAT ought to hold them for awhile as I climb the polls. I hope Cain wins the Republican nomination.